Welcome to Pueblo, Colorado: Home of Heroes. The Courtyard by Marriot is just off of the I-25 Hwy using City Center Dr. (formerly 1st Street). The address is 110 City Central Dr. The convention center is adjoined and the address is 320 Central Main. The Center is host to the five Medal of Honor Recipients from Pueblo. Thus, the “Home of Heroes.” Their statues are displayed along with plaques with the names of other recipients. There is also a multimedia exhibit inside. One block north you can find the Sangre De Christo Arts Center at 210 N. Santa Fe with both indoor entertainment and live outdoor music on Festival Fridays. Next door is the Buell Children’s Museum with fun for all ages. Just behind it is Pueblo’s Chamber of Commerce. El Pueblo History Museum is located at 301 North Union Ave. The Visitors Center is directly behind. While on Union you will pass Memorial Hall. This route will also bring you to the Arkansas Riverwalk, 125 Riverwalk Place. You can stroll along looking at the different boutiques, eateries and even a brewery. The Professional Bull Riders Association is here as is The Center for American Values which houses many portraits of Medal of Honor Recipients. The Riverwalk also offers a boat excursion. The north side offers paddle boats. Both Union Avenue and Victoria Avenue have unique shopping and dining experiences. Driving further on either street will send you to Rawlings Library, 100 East Abriendo. This library and its satellite branches have received the national award for being The Best in the Nation. You can also “play” with their 3-D printer. 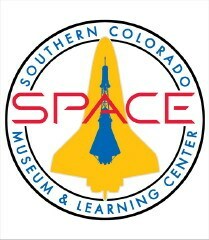 You may also be interested in the Southeastern Colorado Heritage Center and Museum at 201 B. Street, just a stroll from the convention center. Besides Pueblo being known as “The Home of Heroes” , we are also called “Steel City”. You can visit the museum at Steel Works Center of The West at 215 Canal Street. Ice skate? Pueblo Ice Arena is located at 100 Grand Ave. close to the hotel. Rosemont Museum, 419 W. 14th Street, showcases early décor and clothing from Pueblo’s beginnings. Pueblo City Park, 800 Goodnight Ave., offers swimming, tennis, a dog park and the #5 rated golf disc in the nation. 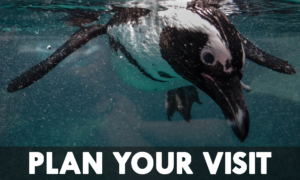 Pueblo Zoo is centered in the park at 3455 Nuckolls Ave. and highlights African Black-footed Penguins, along with lions and zebras and kangaroos. Also, if you drive completely through the park it will take you to Pueblo Blvd. There you turn left (south) and that will take you to Hwy 78 towards the launch site. Heading north on Pueblo Blvd will lead to the Raptor and Nature Center, which features beautiful walking/biking trails along the Arkansas River and a wonderful restaurant on the waterfront. Continuing north will lead you to Hwy. 50 West. Turning West on Hwy. 50 will lead to Canon City. You can visit The Winery at Holy Cross Abbey and sample some of their international award winning wines. You may also want to take the Royal Gorge Route Railroad which runs along the Arkansas River through the gorge surrounded by hundreds of feet of sheer rock. Tickets can be purchased at 330 Royal Gorge Blvd. , Unit B, Canon City. 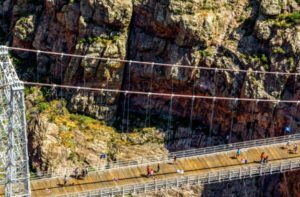 To appreciate the Gorge, visit The Royal Gorge Bridge. A 360 acre feature with an amusement park and the suspension bridge with the Gorge 955 feet below. They also provide zip lines for those that are daring. 4218 County Rd. 3A. Hwy 50 will guide you to the north marina of Lake Pueblo State Park which offers swimming and boat/jet ski rentals. 1 N. Marina Rd. Of course any of the highways heading west will give you spectacular views of the mountains. Take Hwy. 165 towards Rye to find a castle. Bishop’s Castle is a sight to behold. From its stained glass windows to its towering spires and an occasional chance to see the Dragon put forth fire and smoke. 12705 Hwy 165. Taking I-25 North take exit 100-A and drive approximately 6 miles to The Pueblo Weisbrod Aircraft Museum featuring vintage military aircraft, rockets and vehicles. 31001 Magnuson Ave. Going further north will lead to Colorado Springs offering Pikes Peak (average Autumn temperature is a balmy 50 degrees), you may want to check out Santa’s Workshop. Garden of The Gods, the Olympic Training Center at 1 Olympic Plaza is free to the public as is The Air Force Academy just north of the city. The chapel at the academy is breath taking. Cave of The Winds and Seven Falls are also close. All of these locations are well guided by road signs. To get to the launch site Hwy 78 intersects at Pueblo Blvd which is Northern Street heading east. There is an Applebee’s on the Northwest corner and a Walmart on the Southwest corner. From the intersection head west and drive 9.4 miles. The first right turn after mile marker 24 will be your spot. Just look for the large NIKE! Then follow the road. Thanks for coming to Pueblo and we hope that you enjoy your stay!